In our previous Weekly Note, we had mentioned that the Markets remain on tenterhooks and it would be extremely crucial for the NIFTY to remain above the crucial 10275-10300 pattern supports. The session on Friday wiped out the gains in its entirety and the benchmark NIFTY ended the week with a net loss of 31.70 points or 0.31%. Looking at this Weekly figure, it does not suggest any serious weekly loss but the manner in which the volatility ruled the roost all through the week; this certainly remains a cause of worry for the Markets. While we approach the coming week, we brace ourselves to deal with two very critical and crucial levels. One is the 200-DMA on the Daily Charts which stand at 10161 and two; we also approach the 27-month long upward rising trend support line which stands at 10000-10040 range. This also coincides with the 50-Period Moving Average on the Weekly Chart which stands at 10024. With the kind of sentimental damage that we are groping with off late, we do not completely rule out some more intermittent selling bouts, but we also believe the zones of 10040-10160 to act as rock-solid support are and we do not expect this support zone to be easily and comprehensively broken. On the upside, NIFTY faces resistance at 10300 and 10390 zones. The Relative Strength Index – RSI on the Weekly Chart is 46.3042 and it has marked its lowest value in last 14-weeks which is bearish. Daily MACD stays bearish while trading below its signal line. No significant observations were observed on Candles. 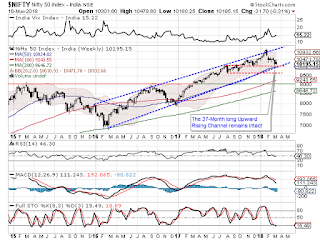 If we have a look at pattern analysis, NIFTY still remains inside the 27-month long upward rising channel. 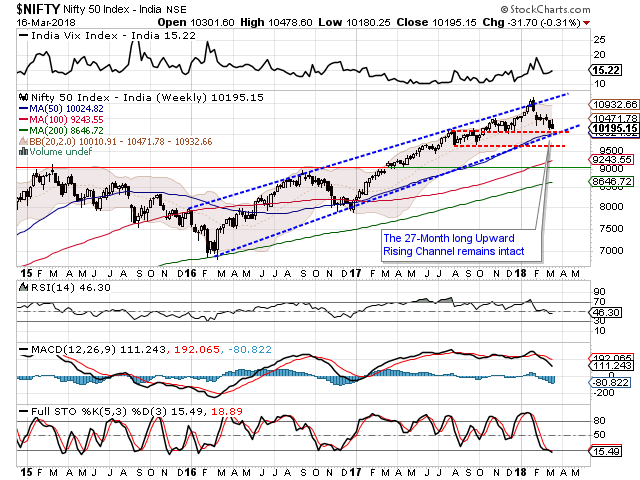 The lower rising trend line – the support line remains in very close vicinity of the current value of NIFTY and is expected to act as a strong pattern support for the NIFTY. We also need to review the present technical situation of NIFTY from a different perspective. Though however strong support that the zone of 10040-10160 may provide to the NIFTY, any breach of these levels will see some prolonged pain getting initiated in the Markets. However, also looking at the present set up and the F&O data, such significant breach below the mentioned support seems unlikely at present. By the time Markets find support for itself, we reiterate staying away from creating any major positions while continuing to adopt a very cautious view on the Markets. 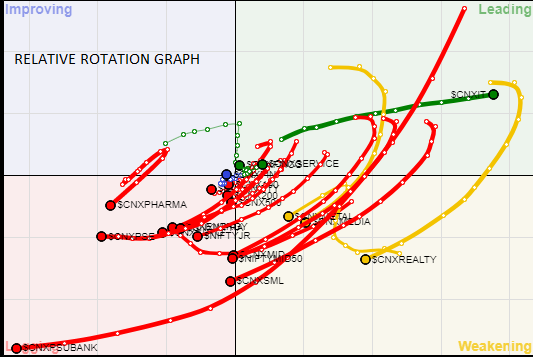 A study of Relative Rotation Graphs – RRG this week show that the IT Pack has shown resilient behavior and this week as well is likely to out-perform NIFTY on relative basis. Along with this, it would also be safe to take refuge in sectors like FMCG, Services Sector, Financial Services, BankNIFTY to some extent and ENERGY who are seen improving their relative momentum against the general markets. Apart from this, very select stocks from Media and METAL pack might see good performance. Apart from this, we do not expect any eye-caching performance from AUTO, INFRA, PHARMA, SMALL CAP Universe, PSEs and REALTY pack.